Orang-utans have brown and rust-colored shaggy fur. They weigh an average of 50 kg (110 lb) and can weigh over 90 kg (200 lb). The orang-utan lives in tropical, swamp and mountain forests, where it eats mostly fruit, leaves and insects. The orang-utan is arboreal and diurnal. It exhibits a sophisticated use of tools for gathering food. Twigs and branches are utilized to construct a large nest-platform in a tree to sleep in at night. Adult orang-utans are generally solitary, except when a male and a female are together for mating. The home range of an adult male usually overlaps the ranges of several adult females. Orang-utans are not territorial. Most animals in a given area appear to maintain a loose relationship, although adult males are hostile to one another. A single young is usually born about every six years. The orang-utan was once found throughout Indo-China, Malaysia and north to China. In historical times it has only been known from Sumatra and Borneo. About 100 years ago it was present in most of the rainforest areas on these islands; however, it was never found in large numbers. It has declined drastically since then. The major causes of the orang-utan's decline have been 1.) in the past, capture for the pet and zoo trade, especially the capture of young, which usually involved killing the mother; and 2.) habitat loss, especially through permanent conversion to oil-palm plantations and for logging. 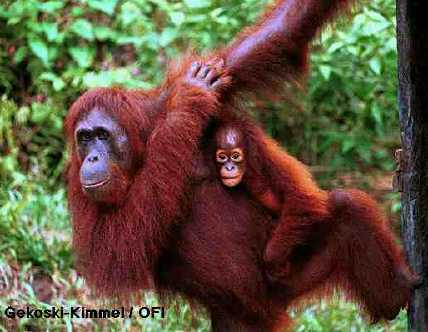 *** In the Malay language, "orang-utan" means "man of the forest." *** "These animals are rare..." (Myers 1870) . *** Captive orang-utans score very highly in comparative intelligence experiments, which is somewhat surprising in view of their relatively simple life-style and social relationships (Macdonald 1984) . The orang-utan was once found throughout Indo-China, Malaysia and north to China, and possibly in India (e.g. the Siwalik Hills). In the past it was thought that the orang-utan had also occurred in Africa: "These animals are rare and inhabit the impenetrable forests of Borneo, Java and Sumatra, as well as those of Guinea and Congo..." (Myers 1870). In historical times it has only been known to occur on Sumatra (Indonesia) and Borneo. About 100 years ago it was present in most of the rainforest areas on these islands; however, it was never found in large numbers. Although no population estimates are available prior to 1959, it is apparent from the earlier literature that it declined drastically during the century prior to the 1970's, especially after the departure of the Dutch from Indonesia and of the British from Singapore after World War II, whereupon the regulations and enforcement against commercial trade in orang-utans ceased to operate (Schuhmacher 1967) . For example, its distribution in Sumatra declined 20-30% from the 1930's to the 1980's, and the species is now found only in the northern part of that island. The Sumatran orang-utan is thought to have declined by more than 50% in the eight years prior to 2000 (IUCN 2003a, IUCN 2004) . The major threats have been 1.) in the past, capture for the pet and zoo trade, especially the capture of young, which usually involved killing the mother; and 2.) habitat loss, especially through permanent conversion to plantations and for logging. A female orang-utan weighs 30 - 50 kg (66 - 110 lb) and grows to about 1.1 m (3.5') in height; a male weighs 50 - 90 kg (110 - 200 lb) and stands 1.2 - 1.5 m (4 - 5') tall. The orang-utan is found in tropical, swamp and mountain forests. Usually only one young is born at a time. Occasionally twins are born. Time between births is generally 7 - 9 years, (average 8). A female orang-utan can produce at most four surviving young over a lifetime (Macdonald 2001) . Young orang-utans are usually weaned by the time they are about 3 years old and are carried by the mother when they travel until they are 4 years old (Macdonald 2001) . A young orang-utan is ready to fend for itself after 6 - 7 years (Speart 1992). Young females generally remain in the vicinity of their birth, but males emigrate to other areas (Nowak 1999) . About 30 years (male and female). Estimates range up to 45 years in the wild and 59 years in captivity. The orang-utan is arboreal and diurnal, with peaks of activity in the morning and late afternoon. It exhibits a sophisticated use of tools for gathering fruit and insects for food. An orang-utan utilizes twigs and branches to construct a large nest-platform in a tree that it sleeps in at night. It usually makes a new nest each night but sometimes reuses one. Although temporary groupings are sometimes formed, adults are generally solitary, except when a male and a female are together for mating. Home ranges of males overlap the ranges of several adult females. Most animals in a given area appear to maintain a loose relationship, although adult males are hostile to one another, apparently even after they are no longer sexually active. Orang-utans are not territorial (van Schaik et al. 2001) . In Sabah, most orang-utans occurred at densities of 1.2 - 3.0 individuals/sq km (3.1 - 7.8 individuals/sq mi) whether or not the forests had been logged for commercial timber (Andau et al. 1994) . Minimum viable population density: 0.10/sq km (0.26/sq mi) (Silva & Downing 1994) .